Then, Amy of Simple Sugar and Gluten Free tweeted asking about what inspires people. I realized that ingredient guilt inspires me. So, I thought about what was in my cupboard, staring at me and that’s a bag of Trader Joe’s peanut flour. I heard about it on The Non-Dairy Queen’s blog. I immediately ran out and bought some. And then I realized I had no idea how to use it. Oops. I’ve never been one to be stopped by not knowing what I’m doing, though. So, this morning I woke up determined to bake something with peanut flour. Another source of inspiration for me is the blogger community and the various challenges and carnival posts. This month’s Sweet or Savory Challenge ingredient is apples. Apples and peanut butter are one of my all-time favorite snack. So, why not combine apples with peanut flour, too? So what do you get when you combine apples, peanut flour, and a cold Wisconsin Autumn morning? An apple, peanut baked good, of course. Scones to be exact. Well, they’re somewhere between a scone and a cookie – moister than most scones, but only mildly sweet. Maybe I should call this a scookie? As a bonus, they’re grain free and vegan as well! For inspiration, I looked to the lovely Elana of Elana’s Pantry and her recipe for almond flour scones, the recipe which has seemed to inspire every grain-free scone on the internet. In a mixing bowl, combine the coconut oil, applesauce, flax seed, and palm sugar. (I mixed this all with a fork.) Stir in the flours, baking soda, and salt. Mix until well-combined. Stir in the chopped dried apple. On a parchment-lined cookie sheet, pat the dough into a circle about 3/4 inch thick. Cut the circle into 8 wedges. Bake for approximately 15 minutes. 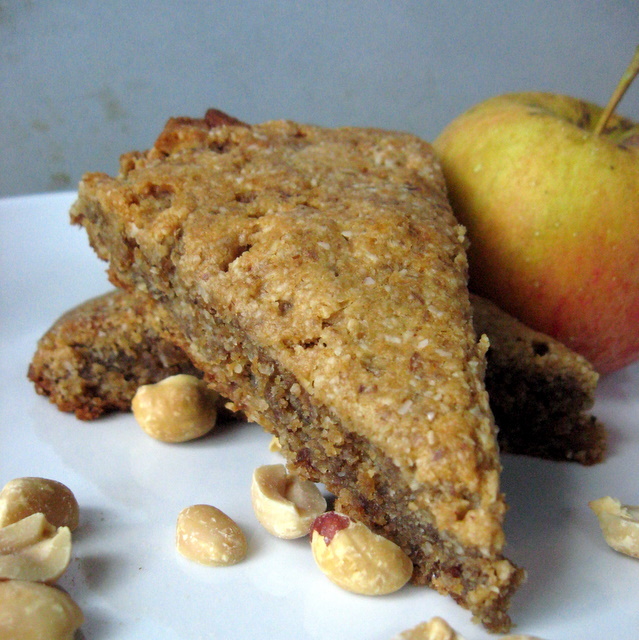 This entry was posted in apples, Blogger Community, breakfast, Cooking Challenges, desserts, grain-free, nuts, vegan. Bookmark the permalink. are you trying to seduce me? holy toledo! looks like it’s time for me to begin my fall baking spree. You’re welcome! The Fall baking spree is definitely on in my house! The peanut flavor is pretty prominent in these, Ricki. So, unless you really LIKE the flavor of chickpea flour, you might want to up the almond flour and add some peanut butter instead…. Peanut flour is also available online through the peanut council, or some such organization. I am with Deanna on this Ricki…in fact a little peanut flour gives a large amount of peanut flavor. Chickpea would be way too bitter. omg those look and sound amazing!! what a perfect flavor combination, and they look like they came out just wonderfully! Seriously creative Deanna. As soon as we move (trying to eat up the pantry right now) I’m going to get that peanut flour. My husband can’t have almonds, and this looks like a great alternative to almond flour. Quick note – my last email to you bounced! It was an update on the ebook – see my blog mid-day tomorrow as I will have a full update. Just thought you might want to see how it is doing. Not only can I relate on ingredient guilt, but with peanut flour in particular! I have a pound of it at home that I haven’t even opened. My husband says that the next time I make these I should add more apples. So, feel free to up the amount of dried apple, too! D’you think using grated fresh apple would add too much moisture? Hm…it might. But, if you have some coconut flour, I think you could toss some grated apple with a few tablespoons of coconut flour to absorb some of the moisture and try it that way. Might need to bake a smidgen longer…. Great idea. I have coconut flour on hand as well! You won my extra copy of Gluten-Free Girl and the Chef. Email your shipping info and it’s all yours. wgregorykahoATyahoodotcom. I LOVE the sound of these – I, too, will have to substitute something for the peanut flour (I’m thinking almond too), but the concept and pic look delectable! If you sub all almond flour, I think it will still taste good – just different. If you do it, let me know how they turn out! These look delicious! I am so glad there are others out there loving the peanut flour! Apples and peanut butter were just made for each other. Have a great weekend! i like this idea. i will have to give this a try. any kind of cupcake is a hit in my house, so I am sure these will be a huge success too!! Yep – I found they got better the next day, too. I love how super duper moist they are – but they become less and less like scones and more and more like a cookie/muffin kind of thing. (I always think of scones as somewhat dry – but in a good way.) No matter – as long as they taste good, right? Right! I actually like that they got cakier…I do like regular scone texture, but usually for me, moister = better. Oh these look fantastic! I have sent my son to school twice this week with apple slices and peanut butter for lunch. Going to have to find me some peanut flour and try these for him! These look fantastic. I’m going to throw in some raisins and cinnamon as well. I wonder if you could substitute mashed overripe banana for the applesauce and dried banana for the dried apple and do a peanut butter & banana variation? Thanks Nicole! I definitely think you could go the banana route and it would be delicious! Of course I’d probably have to add chocolate chips too. Good to know they work with hazelnut flour. I think that peanuts are less “sweet” than other nuts. So, if you do it with peanut flour you might want to do some taste testing to adjust for sweetness. I think various brands of palm sugar also vary in their sweetness, but I’m not positive of that. They are super moist, you’re right. I think they could be less moist, too.